Preparing for Next Generation Security Leader Opportunities is an excellent resource for the new or existing security leader who wants to prepare him or herself for the future of security. In this 30-minute Proven Practices presentation, narrator Francis D’Addario explains that traditional expectations of the security leader will soon merge with new requirements and measured performance. Organizations have come to expect leadership that is able to respond nimbly, communicate care, and galvanize resources. Also included in this presentation is a list of 16 performance criteria by which next generation security leadership can be measured. These criteria are based on Security Executive Council surveys and research from the Security Leadership Research Institute (SLRI). 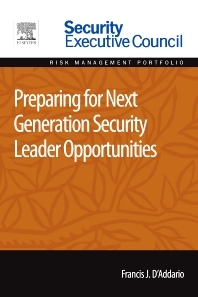 Preparing for Next Generation Security Leader Opportunities is a part of Elsevier’s Security Executive Council Risk Management Portfolio, a collection of real world solutions and "how-to" guidelines that equip executives, practitioners, and educators with proven information for successful security and risk management programs.